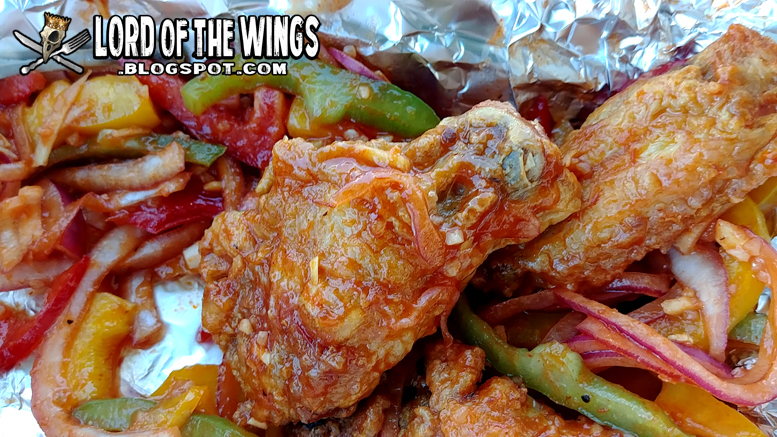 When thinking about chicken wings, I think most people basically think take-out pizza or a sports bar. But you never know where you are going to find them on the menu. A few years ago, I saw a post on Ottawa Foodies, a local food site that emphasizes good food & experiences rather than negative one. 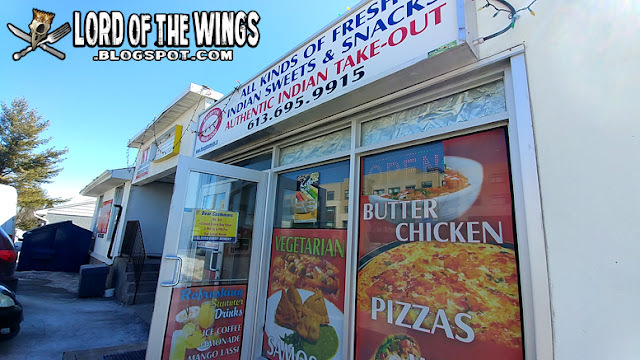 I read about an Indian take-out joint that was doing Tandoori Chicken Pizza, and it looked really good. Brampton Authentic Indian Food. I remember checking out their menu online and saw wings, but never followed up on it. Well, a few months ago we moved to a neighbourhood and we are now like 5 minutes away. My lunch was wide open, so I decided to take a chance and get some wings from a place I would never expect wings from. I checked their menu online before I went just to make sure. Although it's a restaurant, I know they do have meat dishes like a deli that you can cook at home, and I didn't want to get raw marinated wings. 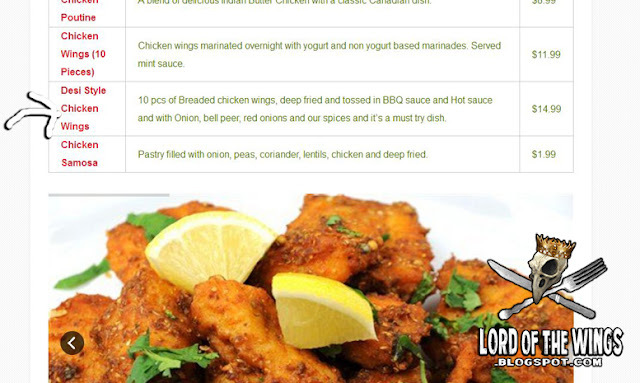 Well they had two types of wings under their appetizers: Chicken Wings, and Desi Style Chicken Wings. 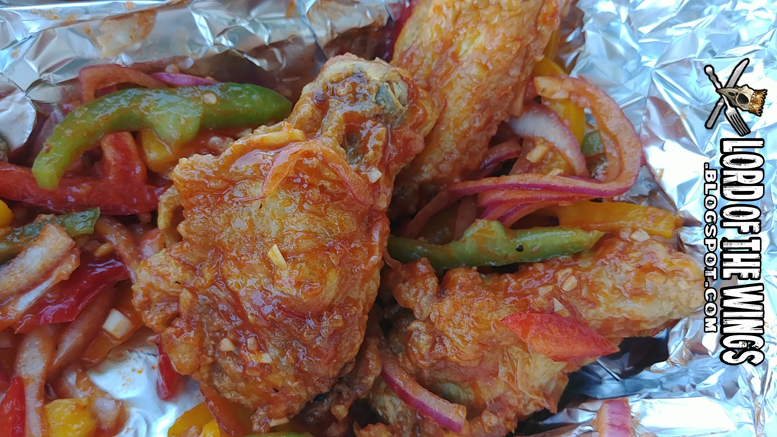 The regular wings sounded good, but the Desi-style seemed kicked up a notch, with deep frying, sauces and all the other sides. Desi, if you are not aware, is an Indian word for the people from the Indian sub-continent. I called up and asked for an order of the Desi-style wings, and was told about 15-20 minutes. Nice. 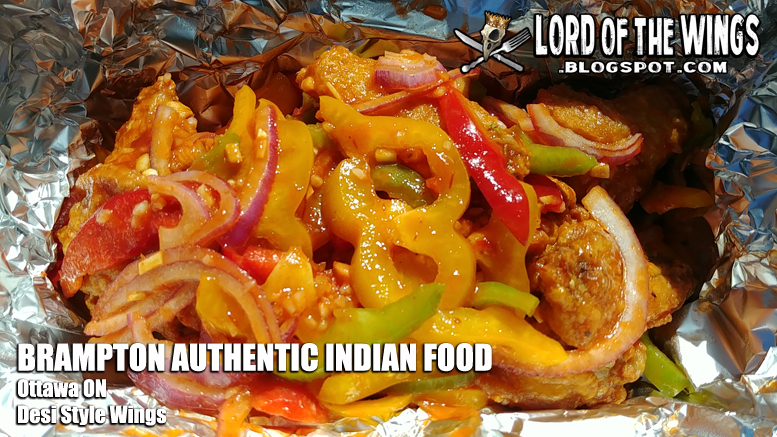 Whenever I've passed by I've never been quite sure what to make of Brampton Authentic Indian Food. The building looks more like a wholesale mini-warehouse when driving by, but when I came up close I noticed the windows have pictures of the food. There were guys loading or unloading from a van out front so I had to time my jump inside like a mini Frogger adventure. Inside, I noticed a very large display case with so many colourful and delicious looking Indian desserts. 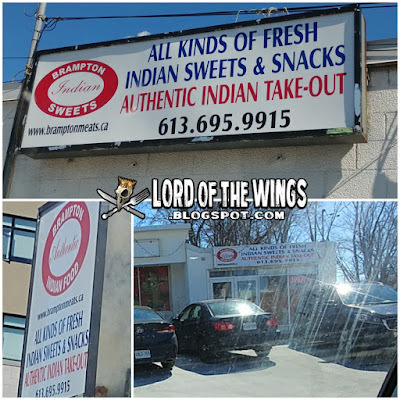 Actually the signs out front both have the name Brampton Indian Sweets, and Brampton Indian Foods, almost like it was two different businesses, but it is one. Speaking of the name, I find it humorous that they call themselves Brampton, a suburb city in the Greater Toronto Area known for it's large Desi population, so much so that Indian friends call it "Brown Town" instead of Brampton. The inside is very white - the floors are white, the walls are white, the ceiling is white. To the right is the sweets and service counter; to the left and up some stairs is a small sitting area. While you can sit there, this really is much more of a take-out place, or I think they do a lot of catering as well. When I walked in the girl behind the counter pulled up my waiting food and called me by name. 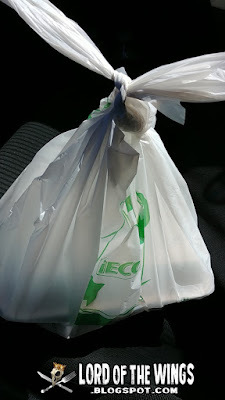 There were a number of take-out orders waiting to be picked up, but as the only white guy (with a very white name) I'm sure I stuck out as the obvious intended customer. I paid and took my order back to the car. The wings were wrapped in tinfoil, in a Styrofoam clam-shell, in a plastic bag. A little environmentally unfriendly with all the packaging, and I felt a little guilty. 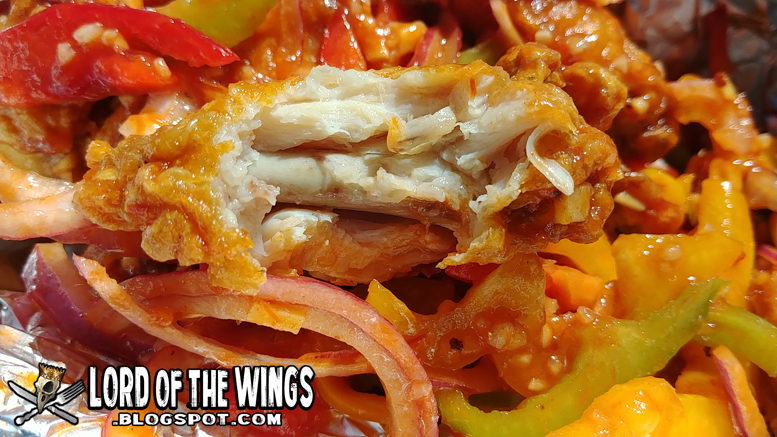 I opened the bag, and the clam-shell, and peeled back the tinfoil to discover the most colourful and unexpected wing experiences ever! Both types of chicken wings come in orders of 10, so I got an order of 10. 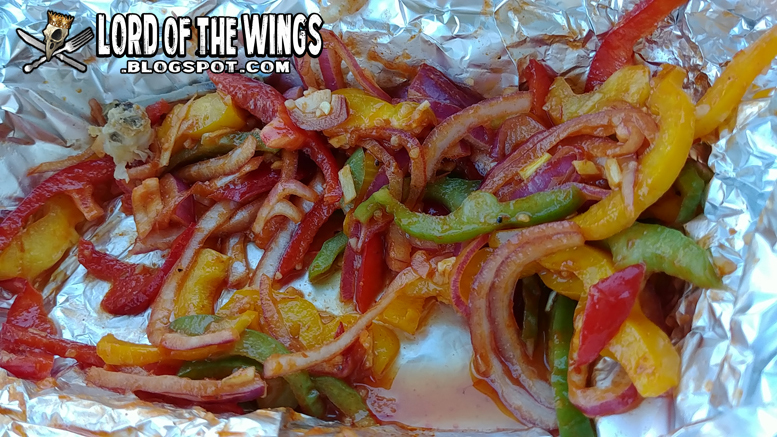 I opened them and at first, I couldn't see wings for all of the peppers, onions and more peppers. Like that's a lot of peppers and onions. Red peppers, yellow peppers, green peppers. Purple onions. The colours! They were all quite soaked in their sauce and spices. I don't know how exactly you are suppose to eat this - I guess with your fingers as you would the chicken wings, but it just feels weird eating it with your hands. The size of the wings were small to maybe a medium, depending on the wing, but most were small. This was mainly in length. The wings were breaded and deep fried, meaning they were slightly larger. 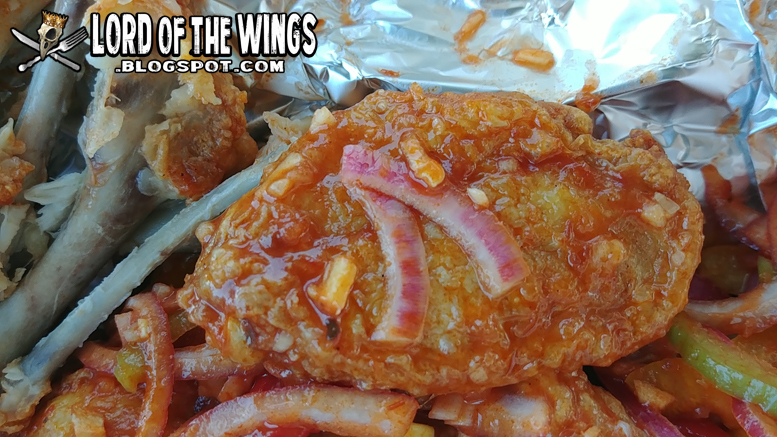 At one point the wings would have been crispy, but with all the sauce the wings were pretty soggy when I got them. When I took a bite that crispy texture was there, but still really soggy. 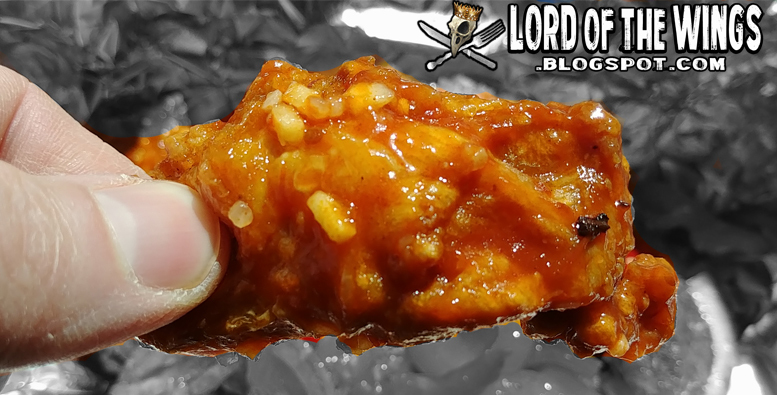 The wings were pretty meaty in size, and that meat was pretty tender. 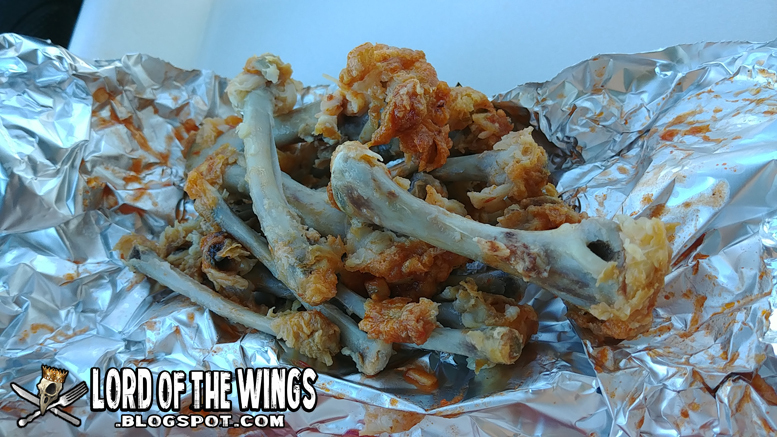 The wings pulled apart nicely and I think they were cooked fresh not frozen. The wings were very very saucy. 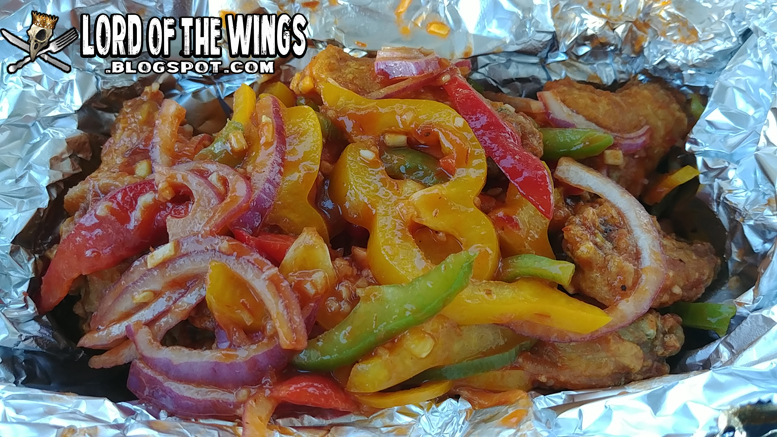 Every wing, every pepper, every onion was covered in the sauce. Their sauce is described as a mix of Hot sauce and BBQ sauce, mixed with spices and the veggies. The flavour that came through to me tasted almost like Manchurian chicken that I've had at Chinese restaurants. It's sweet, it's really garlicky, but there's also some heat. It wasn't killer, but there was some stinging lips afterwards. I have to say they were really tasty, but also unique and familiar at the same time. #tbt = Unpacked Wing Cookbooks!